Nordic-Baltic Translation Blog : Where do most of the internet users live? Dr Mark Graham and Dr Ralph Straumann, researchers at the Oxford Internet Institute, have created a global map showing the total number of internet users in different countries. On the map, the size of each country is based on the absolute number of its internet users, while keeping the countries’ and continents’ shapes close to their true shape. 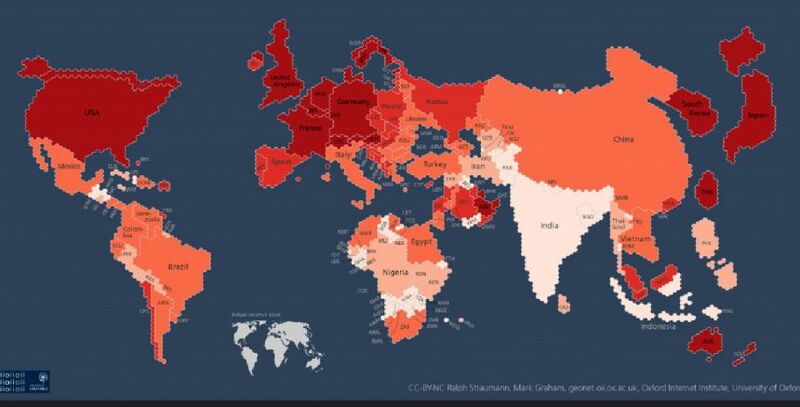 It also shows the percentage of the population that has internet access, with darker shades denoting the higher rates of internet access among the population. This is an update of a similar visualisation in 2011, but this latest version uses 2013 data on internet users and population obtained from the World Bank. The World Bank has tracked the number of internet users per country since the 1990s as part of its Worldwide Governance Indicators project. The map identifies that Asia has 1.24 billion users, so this is the continent where nearly half (46%) of the world’s internet users live. That number is roughly equal to the number of internet users in Europe, Latin America & Caribbean, Middle East & North Africa, and North America combined. China is home to the world’s largest internet population of a country at 600 million people. The United States, India, and Japan then follow as the next most populous nations of internet users with 270 million, 190 million, and 110 million people online, respectively. Even put together, the US, India, and Japan are home to fewer internet users than China alone – despite the fact that most Chinese people have never used the internet. Few of the world’s largest internet countries fall into the top category (above 80%) of internet penetration. Looking only at countries with at least 10 million inhabitants, those in the highest fifth of the distribution (quintile) are (in descending order) the Netherlands, the UK, Japan, Canada, South Korea, the US, Germany, Australia, Belgium and France – mostly European and North American countries. Ignoring micro-nations, all but five of the countries with an internet penetration rate of more than 80% are in Europe, North America, or Oceania – the exceptions being Japan, South Korea, Bahrain, Qatar, and the United Arab Emirates. In 2011, Qatar and South Korea were the only countries outside Europe and North America in the group of countries with the highest internet penetration.